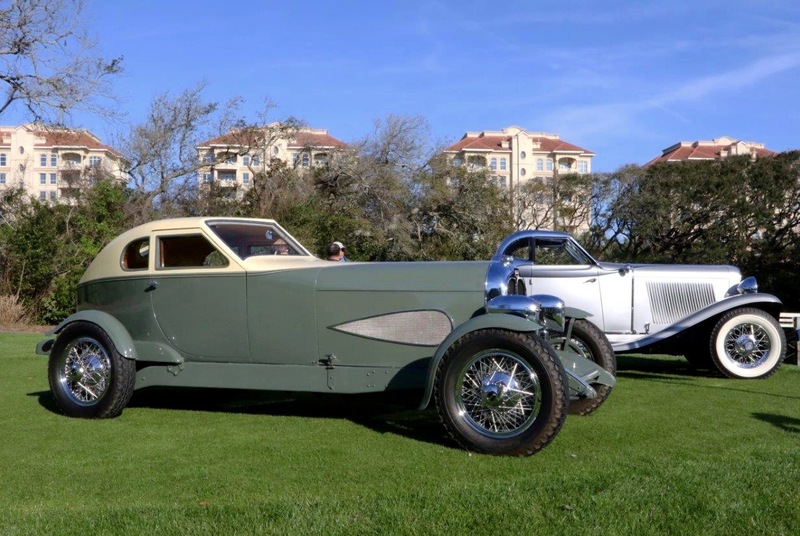 Bill Warner and his team continue to raise the bar; the 23rd annual Concours d’Elegance does not disappoint…even when rain is in the forecast. In a world that appears dedicated to instant gratification, for anything to endure 23 years, let alone thrive and prosper, is unusual to say the least. 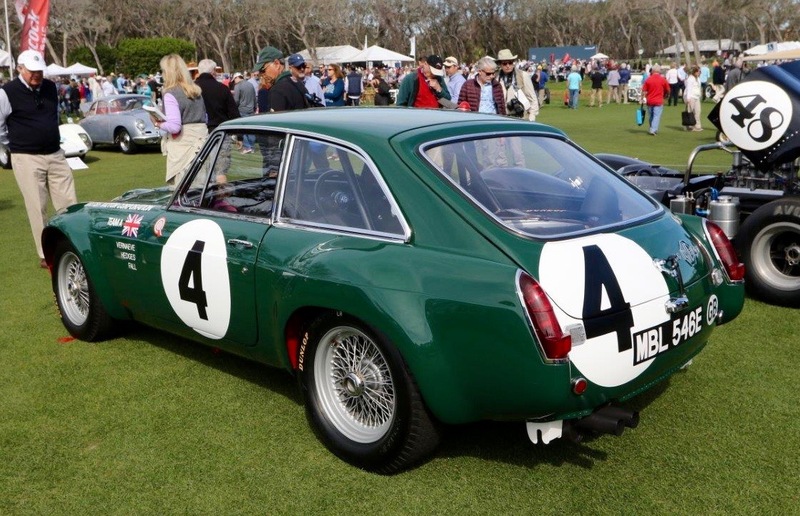 But such is the case with the Amelia Island Concours d’Elegance. For nearly a quarter century it has been treating aficionados to all forms of automotive wonderment in a beautiful setting. This year was no different as the management, staff and volunteers did the impossible; made an annual event seem new. It makes one anxious to see what future events will hold, even as the memories of 2018 are still fresh in our minds. 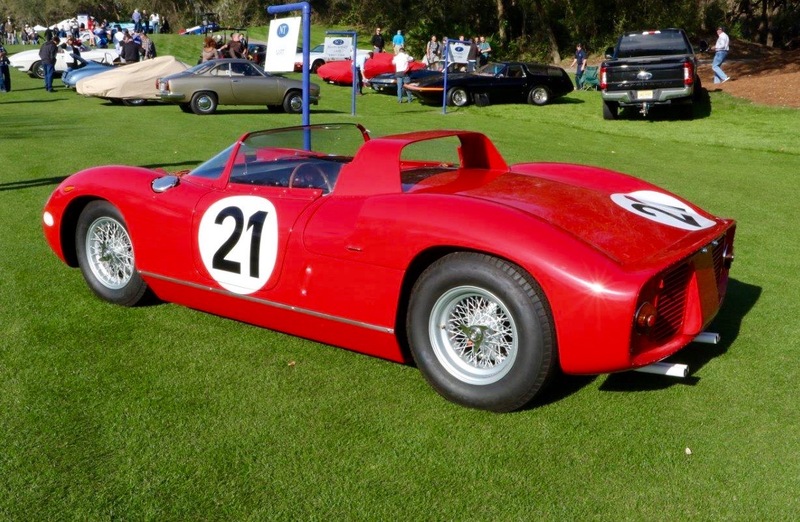 The Best of Show Concours de Sport was awarded to the ‘63 Ferrari 250/275P from the JSL Motorsports Collection,Redwood City, CA and Best of Show Concours of Elegance at the 2018 Amelia Island Concours went to the ‘29 Duesenberg Model J/SJ Convertible owned by Harry Yeaggy, Cincinnati, OH. (Photo: Deremer Studios). 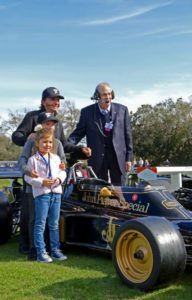 This year’s honoree was two-time Formula 1 World Driving Champion, two-time Indianapolis 500 winner and CART Champion, Emerson Fittipaldi. 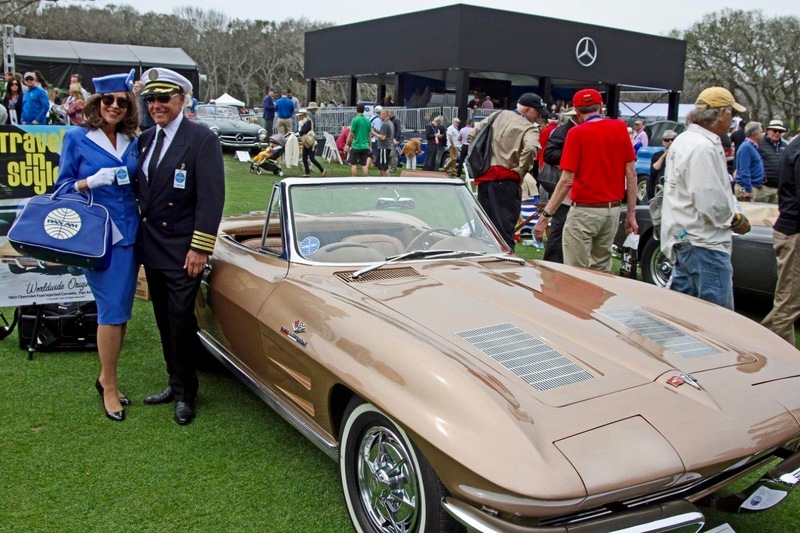 Here he stands before an appreciative crowd with his children and Amelia Island Concours Founder & Chairman, Bill Warner. The Chapman family brought their Lotus 72/5 to add to his special day. 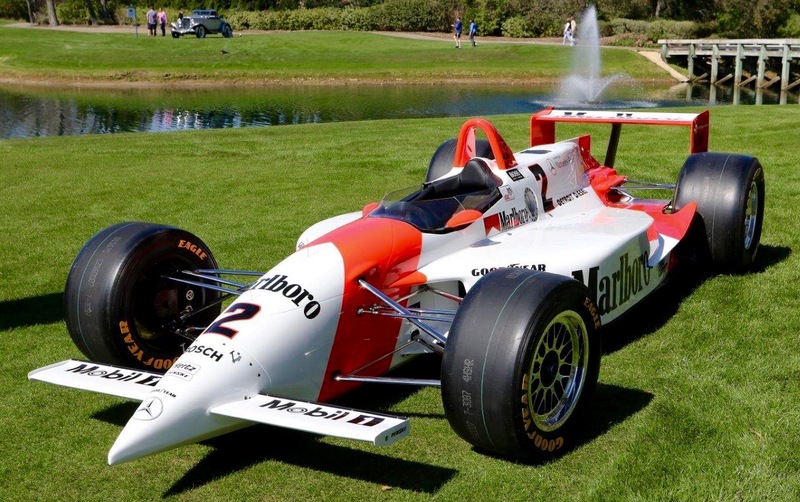 This is the car “Emmo” drove to his first Grand Prix win. 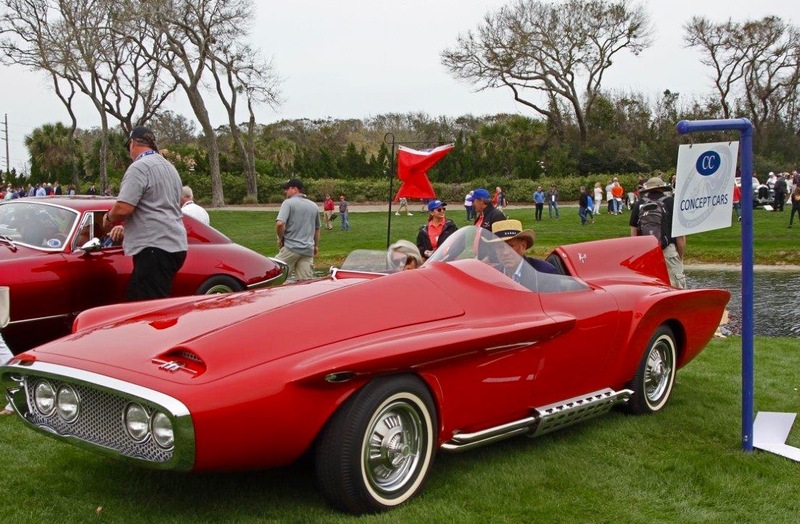 Chrysler hired designer Virgil M. Exner to add some pizzazz to their lineup. Linda & Paul Gould’s Plymouth XNR concept car shows he succeeded admirably. Outrageous Ghia-sourced body covers humble Valiant underpinnings and a NASCAR spec Hyper-Pak Slant Six. After it completed its showcar duties in the U.S., Ghia sold it to the Shah of Iran. It would bounce around the Middle East, hidden from view, until returned stateside and restored. The Goulds aren’t afraid to use it as intended, participating on the Eight Flags Road Tour the day before the Concours. Original, numbers-matching Corvette Sting Ray Fuelie Convertibles are not exactly commonplace, but the backstory of the Vento Collection’s example makes it even more interesting. The original owner was a pilot for Pan Am. He saw a Corvette featured in a Pan Am ad and ordered a duplicate. The car remained in the same family for nearly 50 years until acquired by the Collection. Estelle and Vince took great pleasure in surrounding the car with Pan Am memorabilia and wearing appropriate uniforms. To complete the effect, they handed out peanuts and other treats! On a November evening in 1971, eight teams gathered at the Red Ball Garage in Manhattan to begin an adventure with one simple rule, get to the Portofino Inn in Redondo Beach, CA as fast as you can. Thus was born an automotive legend that has become known simply as the Cannonball. 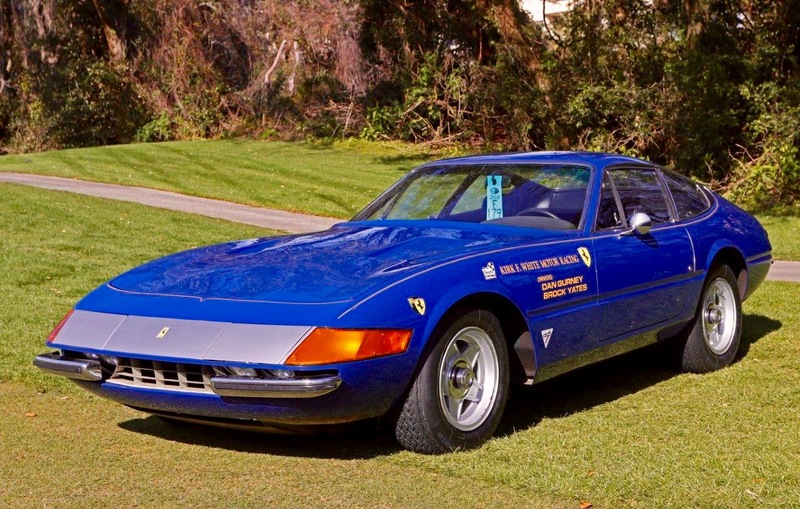 Journalist Brock Yates and race driver Dan Gurney borrowed this Ferrari Daytona from Kirk F. White’s dealership and set their sights Westward. In about thirty-six hours, they had crossed the Continental U.S. at an average speed of nearly 81 mph to become the first arrivals at the Inn. Both of these automotive legends are now gone, Dan Gurney most recently. Thanks to Bruce McCaw for bringing the car and making us smile at the memory of those glorious days. It’s not known if anyone else noticed the USAC rule change that allowed OHV engines to no longer be based on stock-blocks, but Roger Penske and Mercedes-Benz did. Taking advantage of the larger displacement and higher boost levels, they created a 1,000 horsepower beast that had the field covered. Al Unser, Jr, would use that power to claim his second 500 victory in 1994. Mercedes-Benz brought this example, chassis of which was the first to be fitted with the 500-inch engine, accumulating significant mileage in testing and later as a backup. MG lore is full of great stories; Georgann & Henry Camisasca’s MGB C-GTS involves one of our favorites. Constructed in the MG Works Department and nicknamed “Mabel”, the car’s initial competitive appearance was in the Targa Florio. MG noticed that rail crossings may have opened just a bit faster for Italian red cars as opposed to British green ones and painted their cars red. The Italian organizers took a dim view of this and told MG their cars had to appear in their own country’s racing colors. The MG’s were quickly painted back to BRG on top, their undersides remaining red. If you look closely at this picture, you can see the wheel wells are still red! Over their history, scores of cars came under the care of Luigi Chinetti’s NART (North American Racing Team) team. Among them was this show-winning Ferrari 275P. Among its many accolades is a Le Mans victory at the hands of Lorenzo Bandini and Ludovico Scarfiotti. These were early examples of mid-engine Ferraris. With twelve-cylinder engines ranging from three to four liters, they contested and won numerous endurance races. It epitomizes Ferrari racers of the early 1960s. A pair of Auburns stand sentinel on the show field awaiting the throngs of spectators who would enjoy them later. In the foreground is Charlene & Peter Kesling’s recreation of the ‘29 Cabin Speedster. The car features numerous aero touches and a lowered stance. Behind it is DiCarco’s ‘33 8-105 Retractable Hardtop. Designed by inventor Conrad Jobst (the modern toothbrush and compression stockings), it features a top that folds out of sight, allowing open-air motoring. Unlike more modern offerings, this one required quite a bit of manual effort to collapse the top. 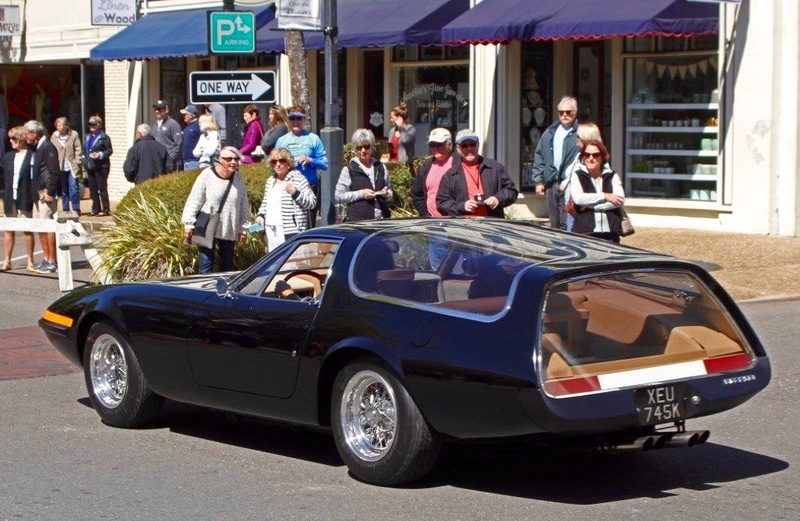 Why exactly one needs a Ferrari Daytona with copious amounts of hauling space isn’t known. But that didn’t stop Coco Chinetti and designer Gene Garfinkle from having Panther Westwinds create just that. Access to the storage is through the rear side windows which open clamshell style with hinges along the center spine of the top. Numerous other changes to the car’s exterior and interior make this car unique. Its high standard of fit and finish make it a standout. Here the car is seen in downtown Fernandina Beach as owners Beth & Ezra Gould enjoy the Reliable Carriers Eight Flags Road Tour. Among the numerous Martini cars present were several from Suzanne & John Campion’s collection. 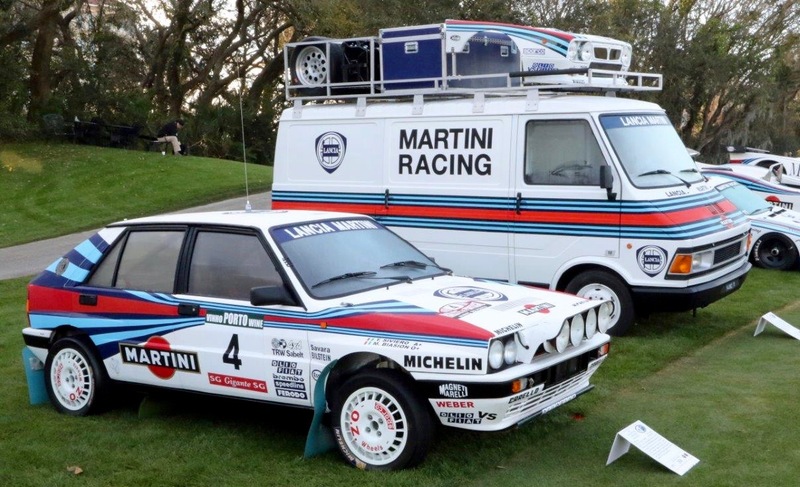 Among them were a ‘88 Lancia Delta Integrale and a ‘81 Fiat 242 service van. The Integrale used its 300 horsepower and six-speed transmission to help take the 1988 World Rally Group A Championship with Miki Biasion behind the wheel. The van supported Lancia’s earlier 037 program. 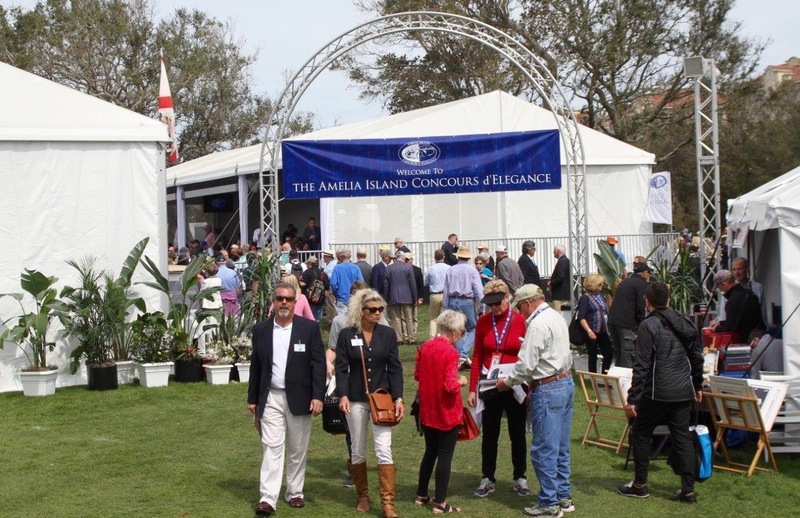 The 24th annual Amelia Island Concours d’Elegance will be held March 8-10, 2019. The show’s Foundation has donated over $3.2 million to Community Hospice of Northeast Florida, Inc. and other charities on Florida’s First Coast since its inception in 1996. Start making your plans now, we have! Loren Hulber’s 1953 Buick Station Wagon was a winner! Great car …. worth looking at! We were there and didn’t have a chance to see or appreciate all the cars mentioned. Thanks for the overview! Mike and Maureen Matune always provide images that makes one feel they are there at the show with them. Thank you, Car Guy Chronicles, for this story.